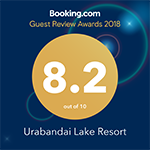 Urabandai Lake Resort was awarded the Excellence Award in 2018. The world's largest travel site. Free wifi internet access is available at Urabandai Lake Resort in Kitashiobara. There is a restaurant, a gift shop and a hot spring bath. The hotel has a sauna and free shuttle service. All rooms at the hotel have a seating area. There is a refrigerator in the room. A buffet breakfast is served at Urabandai Lake Resort. You can enjoy skiing near the property. It is 6 km from Urabandai Lake Resort. Yamagata (Junmachi) Airport is 89 km away.